The relationships between knowledge, technologies, and legal processes are central to the constitution of contemporary societies. As such, they have come to provide the focus for a range of academic projects, across interdisciplinary legal studies and the social sciences. The domains of medical law and ethics, intellectual property law, environmental law and criminal law are just some of those within which the pervasive place and ‘impact’ of technoscience is immediately apparent. At the same time, social scientists investigating the making of technology and expertise - in particular, scholars working within the tradition of science and technology studies - frequently interrogate how regulation and legal processes, and the making of knowledge and technologies, are intermingled in complex ways that come to shape and define each other. 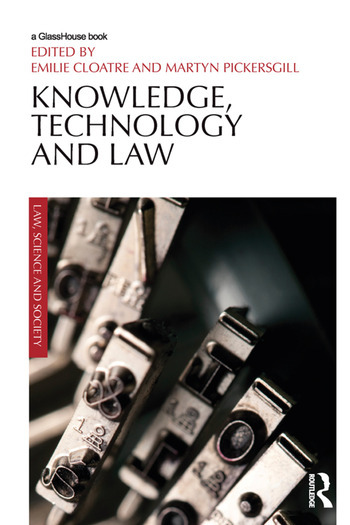 This book charts the important interface between studies of law, science and society, as explored from the perspectives of socio-legal studies and the increasingly influential field of science and technology studies. It brings together scholars from both areas to interrogate the joint roles of law and science in the construction and stabilization of socio-technical networks, objects, and standards, as well as their place in the production of contemporary social realities and subjectivities. Emilie Cloatre is a Senior Lecturer at Kent Law School. Martyn Pickersgill is Wellcome Trust Senior Research Fellow in Biomedical Ethics at the University of Edinburgh.